In October, 2013, the country will mark the 70th anniversary of the so-called Second Republic established under Japanese auspices. In anticipation of that event, the project aims to complete the publication of the Iwahig Prison Diary of Antonio de las Alas, a prominent prewar political and business figure, and member of the Laurel government. His diary, written while he was detained by Allied forces awaiting trial for collaboration, gives a thorough account of the dilemmas and choices made by officials who served during the Japanese Occupation, including their motivations and justifications for remaining in the government. The diary of de las Alas goes backward and forward in time: starting on April 29, 1945 he details the tedium and petty bickering of prison life, he also gives an insight into politics and society during the Liberation Era, while extensively recounting his experiences during the Japanese Occupation. 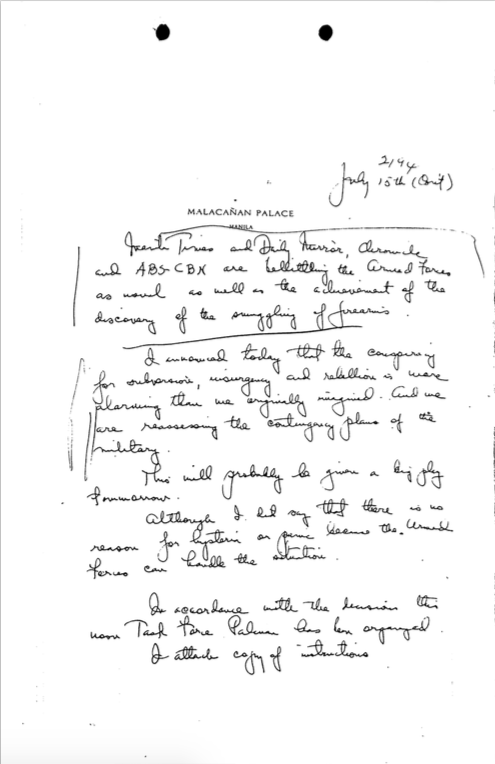 Salvador H. Laurel, son of occupation president Jose P. Laurel, was tasked by his father to keep a diary of their going into exile at the hands of the Japanese (see entries from March 21, 1945 to August 17, 1945). 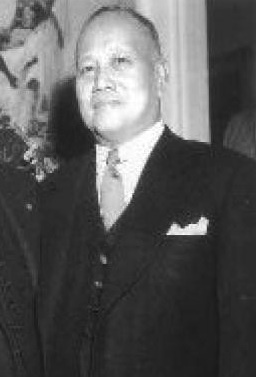 His account bears comparison with the conversations recorded by Francis Burton Harrison, prewar adviser to President Quezon, who again served as an adviser during World War II, when the Philippine government went into exile in Washington D.C. His entries covering the government-in-exile begin on May 30, 1942, and come to an end on May 31, 1944. In the Philippine Diary project, other diarists put forward different facets of life in the Philippines during the Japanese Occupation. Charles Gordon Mock, an American originally imprisoned together with other Allied civilians in the University of Santo Tomas, details his experiences as a prisoner-of-war transferred to Los Baños on May 14, 1943. The experiences of soldiers and guerrillas are captured in the diary entries of Ramon Alcaraz –his entries chronicle the transformation of a prisoner-of-war into a soldier serving in the Japanese-sponsored Philippine Constabulary: and how he used his Constabulary postings for guerrilla activities (the progression of this development can be gleaned from a sampling of entries: June 30, 1942; August 3, 1942; August 30, 1942; February 20, 1943). The diary of Felipe Buencamino III ends with his first few weeks as a prisoner-of-war in the concentration camps established by the Japanese; but he resumes his diary on September 21 1944, at the tail end of the Japanese Occupation (see October 2, 1944 for an example of the growing anticipation of the end of the Occupation): in fact, his diary ends just at the moment of Liberation. His father, Victor Buencamino, chronicles the frustrations, fears, and tedium of being a mid-level official still serving in the government, not so highly-placed as to be ignorant of public opinion, but also, trapped between public opinion and his own problems as someone in government. His diary serves as a counterpoint to the diaries of soldiers and officers in the field, and to the other diaries describing life during the Occupation. Two other diaries remain to be uploaded extensively, namely the Sugamo Prison diary of Jorge B. Vargas, onetime Chairman of the Philippine Executive Commission, and Laurel’s wartime ambassador to Japan, and the diary of Fr. Juan Labrador, O.P, a Spanish Dominican who kept a diary during the Japanese Occupation. But perhaps these will have to wait for future anniversaries. Met the Mayors of Ilocos Norte with the governor, congressman, treasurer and auditor. Distributed about P8 million of their share of the excess of income tax which I have asked the BIR to allocate. Will do the same for the other provinces. Before that met with the Sec. 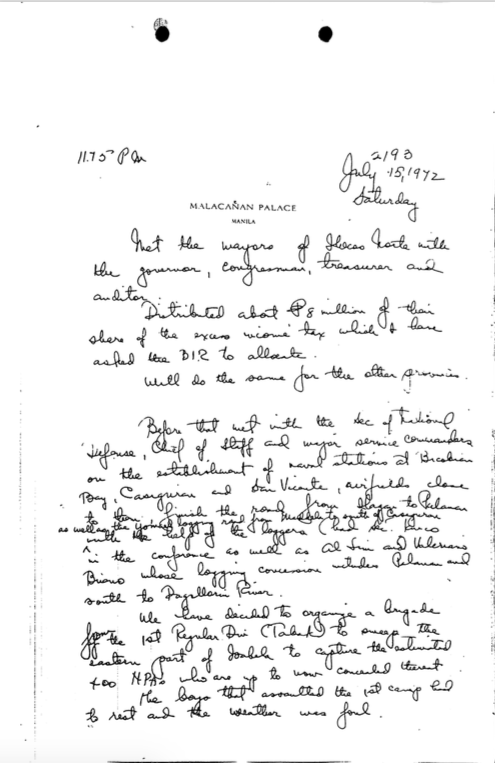 of National Defense, Chief of Staff and major service commanders on the establishment of naval stations at Bicobian Bay, Casiguran and San Vicente, airfields close to them, finish the road from Ilagan to Palanan as well as the (not readable) logging rand from Maddela to south of Casiguran with the help of the loggers (had Sec. Taico in the conference as well as as Al Lim and Valeriano Briano whose logging concession includes Palanan and south Dagallorin River. We have decided to organize a brigade from the 1st Regular Due (Tabak) to sweep the eastern part of Isabela to capture the estimated 400 NPA’s who are up to now concealed interest. The boys that assaulted the 1st camp had to rest and the weather was foul. Manila Times and Daily Mirror, Chronicle and ABS-CBN are belittling the Armed Forces as usual as well as the achievement of the discovery of the smuggling of firearms. I announced today that the conspiracy for subversions, insurgency and rebellion is more alarming than we originally imagined. And we are reassessing the contingency plans of the military. This will probably be given a big play tomorrow. Although I did say that there is no reason for hysteria or panic become the Armed Forces can handle the situation. In accordance with the decision this noon Task Force Palanan has been organized. I attach copy of instructions. The media, specially the newspapers, have forfeited their right to freedom of the press. They have abused it to the point where they actually seek to falsify news. The prime example is the “karagatan” case and the fighting in Palawan. There must be some way to prevent those irresponsible advocates of not press freedom but press tyranny from weakening the state and the democracy that gives them the liberty that their friends, the communists, seek to destroy. Chino Roces, Juan Mercado, Doronilla Granada, the ABS-CBN TV-Radio group, Renato Constantino, even the Bulletin and the Herald are guilty of this abuse. Our informants tell us that they have met and agreed to belittle the communist gun – running and the NPA training camp in Diguyo. I have a clear conscience in fighting them. My family again visited me. Roxas came again. He told us he could not pardon Osmeña for stating that Quezon would have preferred death than cooperate with the Japanese. Senator Eulogio Rodriguez came to visit us. Like Roxas and Arranz he came to offer his services. He is working for Osmeña. Both sides are campaigning hard but those for Roxas seem to be more active. I tried to be non-committal in view of our case. My family visited me. I was very happy as I had not seen them since I left them in Tubao on April 19, 1945. It was the birthday of my wife and I celebrated it by going to confession. That same day we got a good glimpse of the political situation. Among our first visitors were President of the Senate Manuel Roxas and Senator Melecio Arranz. Roxas and his men were very actively campaigning — Roxas was very open in his campaigning. He gave us the impression that Osmeña, his opponent, is against the “collaborationists”. Roxas visited us twice in my one week’s stay. Among other things, he told us how he had been snubbed by Osmeña. He said he went to see Osmeña when the latter came from the United States. Osmeña did not pay attention to him. MacArthur noticed it and as Roxas started to leave, he called Roxas to try to diplomatically get them together. 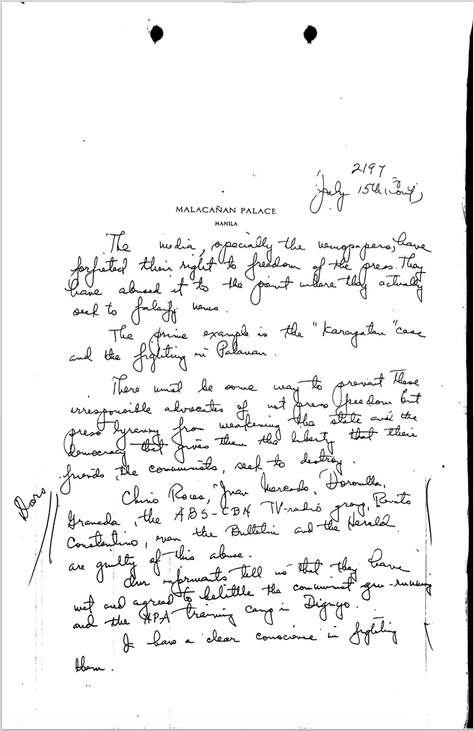 Evidently, MacArthur called the attention of Osmeña, as the next day Osmeña sent for Roxas and treated him in the most cordial manner. We took our breakfast at 5:00 o’clock. At 6:00 o’clock we were on our way to the airport. I could not explain why when we parted from each other most of us were silent and in tears. It was probably because we were not so optimistic as to what will be done to us in Manila. Or perhaps it was the result of about five months of paternal association among us. We arrived at the airport at about 8:00 o’clock due to the bad roads and stops caused by defects in the truck engine. The airport is near the town of Puerto Princesa itself. As we left the barracks and the colony itself, we felt something for these places that was hard to explain as they were the scene of our martyrdom for our beloved country. At the airport we got a good glimpse of the might of the United States. There were countless B24’s which we saw in action in Manila and in Baguio, and B29’s which devastated and crippled Japan. We became more convinced that Japan had absolutely no chance. We left the airport at about 8:30 a.m. in 24-seat transport of a line called “Atabrine”. It reminded us of the daily doze of Atabrine pills we took in Iwahig to protect ourselves against malaria. After going over countless small islands we arrived in Manila at about 10:45. There was nobody to receive us. Our guards had to telephone for trucks. One truck arrived at about 12:30 p.m.; we had been waiting impatiently on account of the extreme heat. The truck was small and one-half of it had to be filled up with our baggage. We had to be crammed in the small remaining space. The trip was as bad as when we were herded in a hold in a boat on our way to Iwahig. As we reached the main Manila South Road, and we turned left, it became clear to us that we were going to be incarcerated at the New Bilibid at Muntinglupa. We arrived at this place at about 3 o’clock. There we were met by Minister Tirona, Mayor Guinto, Vice Minister Pedrosa and others. Later we met Don Miguel Unson. Yesterday I began to pack. Everybody was surprised as they knew that I had also become a pessimist. I told them we were going before next Sunday. Zulueta inquired, “On what do you base your opinion we are leaving soon?” I reasoned out that I expect MacArthur would turn us over to the Commonwealth immediately after the signing of the surrender document which took place on the 2nd instant. After assuming jurisdiction, I was very sure the Commonwealth would take prompt action to release us outright or under bail. I was sure that our government would not presume 119 guilty or at least afford us ample opportunity to defend ourselves. The only way to do that is by releasing us under bail in the meanwhile. Nobody seemed to take my hunch seriously. This morning we woke up full of pessimism and gloom. Even the heavens seemed to decree our fate as it was dark and raining. Not one expected this would be a memorable day. We engaged in our usual activities with despondent demeanor, especially Mr. Zulueta. At about 11:05 a.m. here comes Lieutenant Straddling with his usual solemn attitude. After passing the gate, his face suddenly brightened. He was all smiles. We knew at once he was bringing some news. We were all breathless. We have received so much disappointment that nobody dared to predict favorable news. But when he was near us, he broke the news. Thirty of us were to be taken to Manila the next day. There was no general rejoicing as everybody was afraid that he would not be included among the 30 and nobody knew what the fate of those left behind would be. All listened attentively to the calling of the names. Everyone called burst in joy. After the reading of the names everyone scampered for the list to be sure his name was called or his name was not called. The Lieutenant stopped all chagrin when he announced that we would all be taken to Manila, by groups of about 30 persons in three planes. We hardly slept that night. We were so excited, kept conversing. We built castles in the air. We remembered our dear ones. We would again enjoy liberty and taste the happiness of being with our family. We began to dream of plans for the future. We remembered and repeated the jokes. Many times we yelled, “Ilaw!”, the joke we played whenever we wanted the light to be put out or whenever we wished noisy or talkative fellows to shut up. We began yelling: “Gil! Cafe, chocolate!” Gil is the tall Spaniard we used to mistake for a “Bombay” because he wears a turban once in a while, who prepares coffee or chocolate for us every afternoon or early in the morning. But at about two o’clock, probably because of the intense excitement, we all fell asleep. At about 3:00 o’clock, we were awakened by noises from heavy steps and the “cocinillas” (small stoves) and pans. It was Gil preparing the coffee. Not knowing it was Gil, everyone began to yell, “Ilaw!” Gil answered that he was preparing coffee. How could it be — it was only 3:00 o’clock! We were not expected to take our breakfast until 5:00 o’clock. But Gil insisted that it was already after 4:00 o’clock. We all consulted our timepieces. It was clear his watch had stopped. We could no longer sleep. We stayed awake in our cots until about 4:00 o’clock when we got up and prepared for the day.